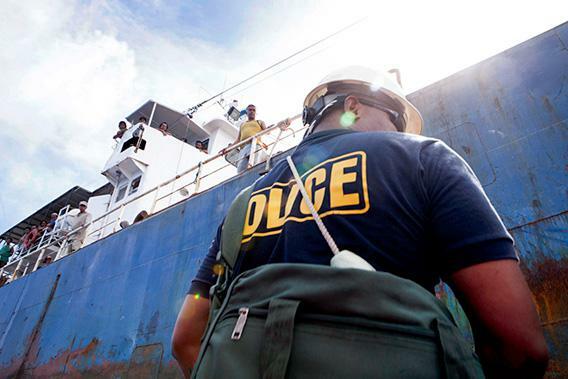 Tuna protection and piracy: PNA changed the rules of the high seas. Eight tiny Pacific island nations banded together to fight pirates and change the rules of the sea. Palau marine officer Earl Benhart prepares to board the Sal 19, a fishing vessel transiting through Palauan waters. The Sal 19 was one of the three boats caught unlawfully moving tuna. In the ice-cold cargo hold of a pirate tuna vessel in the Pacific, I have somehow lost my shoe. Frozen tuna fins slice my unshod foot as I fumble around on all fours, reaching into the gigantic, frigid pile. I had boarded the pirate ship Heng Xing 1 with the crew of a Greenpeace vessel, the Esperanza, which is helping the island nation of Palau patrol the ocean. 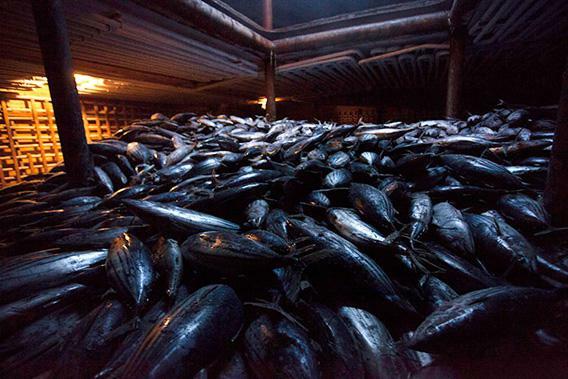 We caught the Heng Xing 1 and two other ships on the high seas laundering tuna. Illegally moving tuna from one boat to another hides the fish’s origins, making it impossible to know who caught it and where. The tuna itself is mainly skipjack, the kind in cans that America eats at a rate of 2 1/2 pounds per person per year. Farah Obaidullah, the Greenpeace expedition leader, stands nearby with one leg jauntily propped on a pile of frozen fish as her crew speedily documents the plunder. They take a lot of flash pictures, and I use each burst to look around, making sure I’m at least retaining the rest of my clothing as I flail about in tuna. For Obaidullah and Earl Benhart, Palau’s marine officer on board, it’s a typical day in the struggle to protect the world’s last healthy tuna populations from the perils of the lawless sea. Tuna is the oil of the Western and Central Pacific, with the region’s stock worth $5.5 billion. As unregulated fishing collapses tuna stocks elsewhere and global demand for tuna grows, the value of the fish here continues to climb. One Pacific bluefin recently sold in Japan for $1.76 million, and over the past four years, the cost of licenses to fish tuna in this region shot from $400 per day to $6,000. High prices and healthy stocks are a huge magnet for pirate fishers who flock to this part of the Pacific. In 2010, Palau recorded about 850 pirate fishing vessels plundering its waters. Keeping the fishing regulated and the pirate fishers at bay is a massive and economically critical job. To do it, Palau and seven of its Pacific neighbors, collectively called the Parties to the Nauru Agreement, are going to extraordinary lengths to protect their tuna economy, taking on not only the high-seas mayhem but also distant fishing powers who want more and more fish. And if the PNA’s revolutionary methods catch on, they could have far-reaching repercussions not only for the beleaguered tuna but also for the health of our oceans. Palau is a string of emerald islands jutting up from the kind of impossibly clear waters that beckon from posters on corporate walls. It’s one of the world’s premiere dive sites, so tourists abound, but Palau has only around 20,000 inhabitants. When I asked locals how to reach their president, they gave me directions to his house. President Thomas Remengesau Jr. greets me in a tracksuit and aviator glasses, looking more like the guy who should protect the president than the president himself. He leads me to his backyard, and we sit in the shade near his pet alligator and parrots. He leans back in his chair and asks me to call him Tommy. So I ask Tommy how this tuna revolution started. For a long time, he tells me, Pacific island states were losing out to distant-water fishing powers like the United States, the European Union countries, Taiwan, and the Philippines. The island states, by and large, don’t have their own fishing fleets or canning facilities; instead, they make money by leasing the right to fish their waters to rich countries with big boats. Until the PNA came together, powerful fishing nations simply played one island-state off the other to get the lowest-priced lease. This was obviously bad for the Pacific states, but it was also bad for tuna, since there was no real, orchestrated effort to sustainably manage the fish. This, by the way, is how things generally go around the world for commercial fishing. Remengesau takes a long sip of water. “So it became evident that we needed to really take stock of our resources and that there’s strength in numbers. That it would be a move in the right direction to begin to address the problem together,” he says. The first move came 10 years after the eight nations—Micronesia, Kiribati, Nauru, the Marshall Islands, Palau, the Solomon Islands, Papua New Guinea, and Tuvalu—formed the PNA. In 1992, they signed an agreement stating that they’d work collectively to manage their tuna stocks and limit fishing in their waters. This was a really big deal. Once the PNA decided to act as a block, they suddenly had nearly half of the world’s skipjack tuna—America’s favorite fish—and nearly one-third of the world’s total tuna inside their joint territorial waters. They became the Saudi Arabia of sashimi. This move, Remengesau says, was highly unorthodox. “But,” he says, smiling, “I’ve been in leadership long enough to understand that if you think inside the box, very little meaningful change will happen.” From this new position of strength, the PNA began making a lot more changes. Big Move No. 2 came in 2007, when the PNA flipped the divide-and-conquer game through their “vessel day scheme.” The plan limits both the number of boats in their collective waters and the total number of days those boats are allowed to fish. The PNA then auctioned off fishing days to the highest bidder. The vessel day scheme put the PNA in a position of power: Tuna-fleet nations suddenly had to outbid one another instead of playing the islands off one another, and capping the boats and days meant less tuna caught for more money. “Because everyone will tell you,” Remengesau says, “that at the rate we’re going, there won’t be any big-eye tuna or bluefin in the near future.” (In fact, in early January, scientists released data showing that bluefin tuna in the North Pacific will soon be effectively extinct.) Remengesau leans back and takes a long sip of water. I take the moment to make sure the alligator is nowhere in sight. When he’s done, he leans in a bit and tells me how the PNA created the world’s largest certified sustainable purse-seine fishery. Purse seining uses giant nets slung between boats to scoop up entire schools of tuna and, often, everything else—so-called by-catch that can include anything from sea turtles to whale sharks. Purse seiners rely heavily on the territorial waters of PNA nations, which means those vessels need fishing licenses. So the PNA made these licenses contingent on the boats following strict rules designed to limit both tuna catch and by-catch. In effect, the PNA used its fishing licenses to create the world’s largest sustainable purse-seine fishery. So sustainable, in fact, that the fishery was certified by the Marine Stewardship Council, a nonprofit organization that sets standards for sustainable fishing. Bill Holden, the MSC’s Pacific fisheries manager, later told me it’s rare for the nonprofit to certify a nation—or eight nations, for that matter; usually, they certify only individual boats or companies. But, he said, it’s also rare for a fish-rich nation to influence the behavior of the foreign fleets plying their waters. Big Move No. 3. But then, Remengesau says, came the Biggest Move of all. One of the challenges the PNA faces in protecting its tuna is that tuna moves. Unlike most fish, tuna are warm-blooded, and their warm muscles make them incredibly strong swimmers. Yellowfin can reach speeds of up to 50 miles per hour and navigate enormous distances, sometimes crossing entire oceans. To really protect tuna, the PNA needed to somehow section off vast swaths of international waters, something that, technically, a small clutch of island countries should not be able to do since the open ocean belongs to all states. So the PNA pulled a highly controversial move. In 2010, they again leveraged their power through their fishing licenses, telling foreign companies that if they wanted to fish the PNA’s teeming, tuna-rich territorial waters, they had to agree to not fish the international waters in between territories. Once again, purse seiners had little choice but to agree. In one audacious act, the PNA established the world’s first protected pockets of international water—four of them—that, together with the nations’ own waters, create a 1.7 million square mile tuna highway, roughly half the size of Europe. Big Move No. 4. In a few short years, the PNA managed to upend traditional power relations between the distant-water fishing nations and host countries, establish the first country-run MSC-certified sustainable tuna fishery, and establish vast tuna highways for the migratory fish. Not bad. At the end of our talk, I ask Remengesau why Palau and the PNA are moving so quickly. The body that sets the laws in this part of the Pacific is the Western and Central Pacific Fisheries Commission. It held its December meeting at the giant International Convention Center in Manila, Philippines. The heavyweight conference draws more than 600 furrow-browed delegates from the European Union, the United States, Japan, China, Taiwan, the World Bank, and dozens of other nations all gathered, United Nations-style, with nameplates and microphones. The commission regulates almost 20 percent of the world’s surface and more than half of the world’s total tuna. Although this is a fisheries commission, no one even tips a hat to other fish. Wrangling here is 100 percent about tuna, which might be a head-scratcher—except that tuna in the Pacific is about more than tuna. The Pacific is key to America’s positioning vis-à-vis China, and the two nations are locked in an escalating game of checkbook diplomacy. Last year, Hillary Clinton became the first U.S. secretary of state ever to visit the Pacific Islands Forum, the major political body in the region. She jubilantly declared this century “America’s Pacific century—emphasis on the Pacific” and announced $32 million in investment and aid to the region. “The ‘Pacific’ half of ‘Asia-Pacific’ doesn’t always get as much attention as it should,” Clinton said. “But the United States knows that this region is strategically and economically vital, and becoming more so.” The Obama administration, it seems, sees the Pacific as a counterbalance to Asia. Palau’s Earl Benhart and Greenpeace’s Maria Cristina Nitafan interview the captain of the Sal 19. The Sal 19 painted over both its name and call signs and did not have a log book on board. However, Palau could not detain the vessel since it was on “innocent passage” through their waters. Filipino authorities are investigating the incident. Those negotiations are under way right now. The last U.S. tuna treaty was negotiated 25 years ago, before the PNA-dominated era. So far, the PNA has successfully used its strength to triple America’s annual tuna fees from $21 million to $63 million, but the U.S. is balking at the vessel day scheme to limit boats and hours. The PNA isn’t backing down. The fisheries commission gave the PNA a major victory, closing two of the four high-seas pockets to purse-seine vessels and making the PNA’s regulatory sleight of hand the law of the sea. The move continues to be highly controversial, and the rules shift from year to year, but the high-seas pockets remain, largely, off limits for purse seiners. Palau and its neighbors have a strong set of rules, but that’s only half the battle. There is still the issue of illegal and unregulated boats simply stealing fish; there is still the issue of who controls the high seas. The PNA has closed off nearby international waters to its licensees, but that doesn’t stop others from illegally fishing there, and the PNA has no authority to stop them. Worse, even if the PNA had the authority, they don’t have the resources. Palau, for example, polices a 250,000 square miles of its own territorial waters as well as the high-seas pockets it helped create. All with a patrol “fleet” of one. Which is why Palau had asked Greenpeace’s Esperanza to help out: When the Esperanza arrived, it doubled Palau’s enforcement capacity. Once I extricate my shoe from the belly of the Heng Xing 1, Obaidullah explains that the boat’s captain freely admitted moving the tuna—apparently unaware that it’s illegal to do so. Plus, the Heng Xing 1 is flagged by Cambodia, a nation that isn’t a member of the WCPFC, so it has no right to be here at all. But when the Greenpeace team finishes taking pictures and thanks the very welcoming crew, they simply return to the Esperanza. Obaidullah explains that even though the Heng Xing 1 and its two companion vessels all broke the law, Palau, and therefore Greenpeace, didn’t have the authority to stop them. 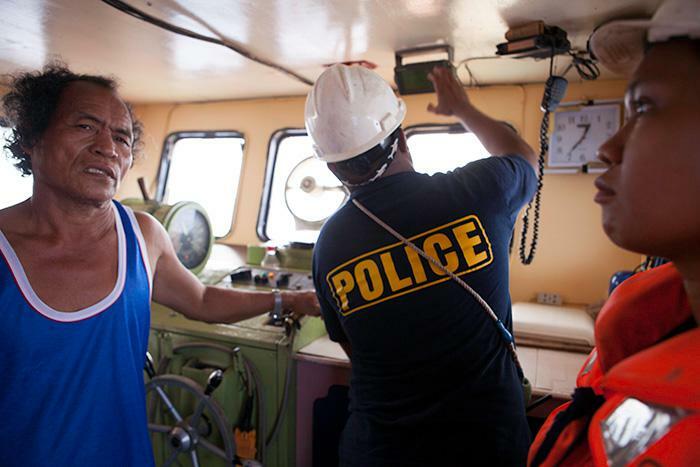 Palau can only bust boats it catches breaking laws inside its own waters. Since the laundering happened on the high seas, Palau had as much jurisdiction as a Los Angeles cop in Paris. Greenpeace activists approach the Heng Xing 1, a refrigerated, or “reefer,” vessel used to transport tuna from fishing boat to port. 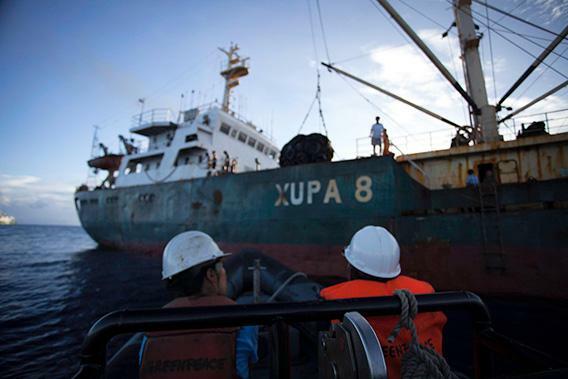 Greenpeace sometimes works with the nation of Palau to help monitor and report unregulated fishing on the high seas. “Ships like this can get away with catching as much as they like,” Obaidullah tells me. While it’s impossible to know exactly where the Heng Xing 1 tuna was caught, pirate fishers often illegally catch fish inside the fertile territorial waters of island states and then escape into the high-seas no-man’s-land to transfer it to refrigerated ships. If you’re a pirate fishing captain trying to get your stolen catch to port undetected, this is how you do it. “They can move it onto other vessels, supply the market with tuna, but meanwhile nobody knows where it was caught, when it was caught, or if they obeyed the rules. It’s impossible to manage fish stocks with vessels like this,” she says. The activist cops could only document the incident and then try to get the Heng Xing 1 blacklisted so it would have trouble off-loading its catch in the future. The incident, far from unusual, highlights just how far laws and enforcement on the seas have to go before the PNA’s tuna-protecting crusade can fully succeed. Fortunately, the world is beginning to take steps, slowly, in the right direction. Interpol announced recently that it plans to tackle fish laundering, which would mean that a fleet with actual authority to enforce high-seas law would, for the first time, patrol international waters. How many boats, where they would patrol, and what it means are all being worked out. Meanwhile, a new international effort, called the Global Ocean Commission, was announced in February to rein in pirate fishing and combat lawlessness on the high seas. “The current enforcement on the high seas is inadequate at best and worthless at worst,” former U.K. foreign secretary David Miliband, who will co-chair the commission, told the Guardian. The cost to the world in lost marine resources is valued in the trillions, a staggering impact greater than the global financial crisis. “We’re living as if we have three or four planets instead of one,”Miliband said. These moves, among others, could signal real change. But they’re fledgling, and details are unclear. In the meantime, a case can still be made for giving the PNA a lot more boats.